Whole hops: Also known as raw hops or leaf hops, whole hops are whole, dried hop cones that are compressed into 200-lb. farm bales, and later repackaged for craft brewers and home-brewers. We offer a wide range of quantities with an ever-expanding list of hop offerings for our diverse set of hop consumers. All hops are packaged in vacuum sealed, double nitrogen flushed Mylar barrier bags (not clear poly bags) and stored at 26 degrees Fahrenheit (-3.33 degrees Celsius) to maintain optimal freshness. Note: As with all of our products please contact us for our current wholesale pricing options. We maintain a high level of attention to detail, quality, sanitation and consistency using advanced hop processing equipment. Our Dauenhauer hop-picking machine methodically harvests hop vines. This harvester uses gentle picking fingers to harvest hop cones, and a series of fans coupled with dribble belts to clean and sort the hops. CHF consistently picks 0% leaf and stem hop lots. 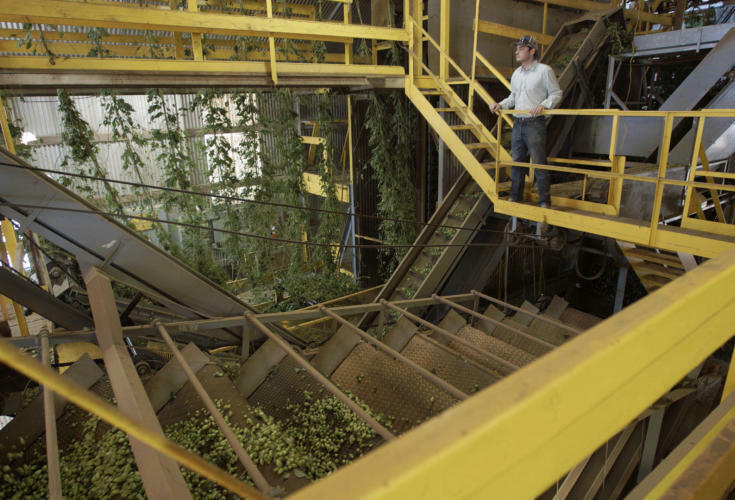 We dry our hops at low temperatures in our five kiln natural gas-powered hop dryer. 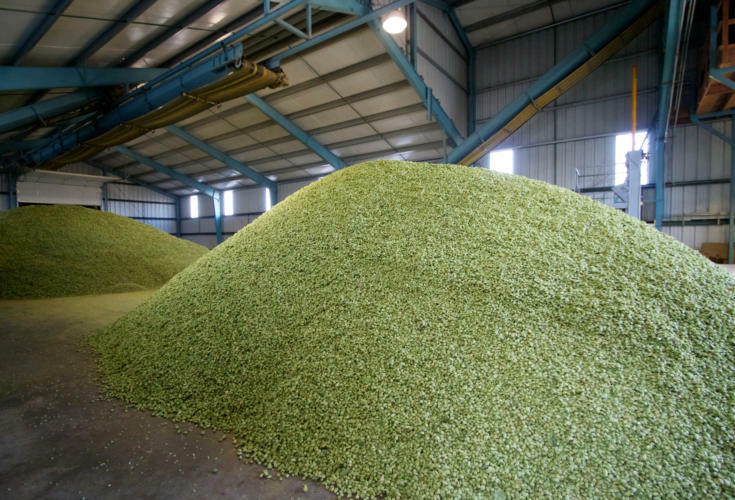 All hops are dried to target moisture of ~9%, which allows for consistent hop drying season long. 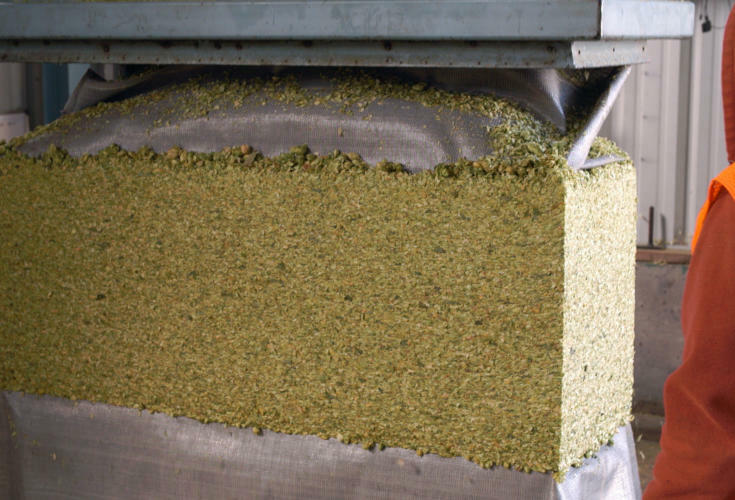 The drying process is critical for optimum retention of essential hop oils and aromas, as over drying or over heating the hops can adversely affect the natural hop character. 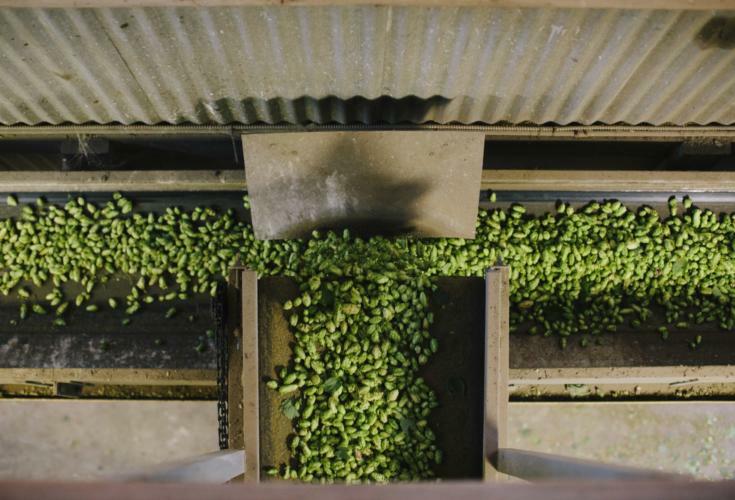 Here at CHF, we approach the drying process the same way we do our T-90 pellet production: as a highly honed craft where science and art are perfected to create the ultimate hop product. All Crosby hops are baled in standard 200-lb. U.S. bales. Our baling cycle is fully computerized, which leaves no room for operator error in making a bale (for example: over compression, overweight, underweight, etc.) Over compressing a bale is potentially damaging to the hops’ lupulin glands, which ultimately contribute the hop aroma and character you expect. Our baling process preserves the integrity of the lupulin glands, bringing you the craft-worthy hop products you love.